Arturo Fuente Rosado Sungrown Magnum R is a peculiar blend from the world-renowned Fuente family of cigar artisans. For starters, the classically designed brand debuted in 2009—despite having the appearance of a generations-old classic. And, differing from the family's signature OpusX blend—known for its powerhouse strength—the Magnum R shows a restrained character, offering a relaxing and contemplative smoking experience. Crafted in a time when the entire cigar world was in a race to create the next "nicotine bomb," Master Blender Carlos “Carlito” Fuente Jr. reversed course, showing that big flavors do not necessarily need to be bundled with palate-pounding strength. To accomplish this, he selected a much lower priming (as compared to other Fuente blends) from a familiar Ecuadorian Sun-grown Sumatra plant. This low-priming (less strength, better combustion and aroma) leaf was aged for roughly 10 years and incorporated as the Magnum R's wrapper. 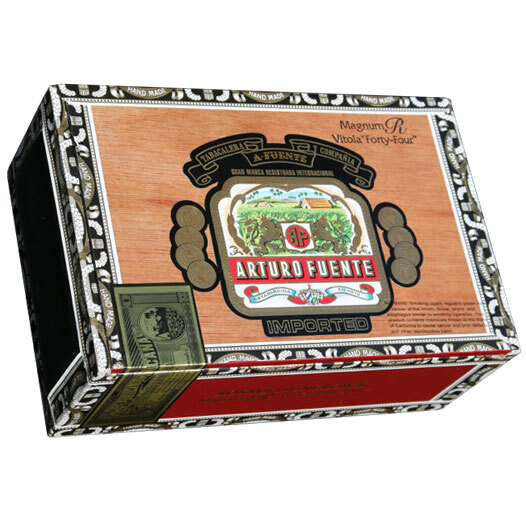 The blend was then rounded out with the Fuente's own Dominican-grown tobaccos in the binder and filler, displaying lively flavors of sweet cedar, maple, cinnamon, apricots, and exotic spice—all while maintaining a strength that lies just under medium. In other words, smoke this any time of day and let the sheer flavor output provide the entertainment!